You get 25 glowsticks in an assortment of 5 bright colors. They include detachable connectors along with neck string, so you can wear them or hang them anywhere, which your customers will appreciate. Many other vendors won't include these extras. Just shake or snap them to break the ampule inside the glowstick and a harmless chemical reaction will create a glow (but no heat) that lasts for 6-8 hours. Each glowstick is 6" long by 10mm. They last for a long time in storage, so you can keep what's left over for your next event. Not produced by or the product of a particular Indian or indian tribe as defined by 26 USA - 605 et Seq Glow sticks are a great seller at pow wows or any festival which has activities after dark. 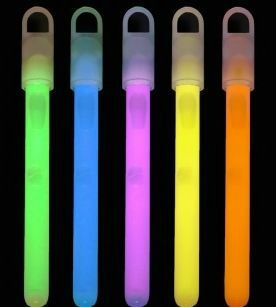 Dances, parties, community events, fairs, carnivals, and youth events all love glow sticks!